It’s winter in Vermont. While most of us are cozy in front of our wood stoves and heaters, hundreds of Vermonters have no place to call home. No place to cook a meal, get warm, take a shower, or do homework. No place where they feel safe and secure. For thousands of homeless Vermonters, John Graham Housing and Services has been the answer to this enormous challenge. During the week of February 9-15, you can help them answer that challenge by rounding up your total at the register (or donating even more, if you can!). 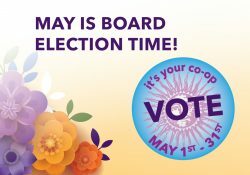 The Co-op will match whatever is raised by our shoppers and donate it to this amazing organization. The Shelter will use the Rally for Change funds to deliver healthy food to homeless families and individuals living at their five buildings, and to provide first month’s rent and deposits directly to people who are moving into permanent housing. In other words, every cent raised through the Rally for Change will go directly food and housing for homeless people. The organization began as a shelter for individuals, but about twelve years ago, it evolved into an emergency shelter that could also accommodate families. Today, in addition to providing emergency shelter for around 25 people at their main building in downtown Vergennes, John Graham also owns and operates other housing units in town, as well as in Bristol and Middlebury. Each year, John Graham helps find housing and support services for around 200 individuals. While many of these clients use the services of their emergency shelter, many more benefit from assistance with long term housing, which helps them establish a rental history and move on to more self-sufficient housing opportunities. Many clients also benefit from clinical support services, to help with the mental and emotional health issues that so often go hand in hand with homelessness. Please take a few minutes to watch this video about the shelter. As a state, we have made tremendous progress in ending homelessness. The number of homeless individuals dropped by 29% from January 2014 to January 2016. And yet still, well over a thousand Vermonters will live outside or in emergency shelter this winter. With your help, we can provide food, shelter, and hope to transform the lives of our neighbors. There is not a single state in the country where a full-time minimum-wage worker can afford a market-rate one or two-bedroom rental.14 Vermont is no exception. Rising rents, stagnating wages, and an extreme lack of affordable housing mean that Vermont families have less and less access to safe and stable housing. At the same time, rates of homelessness are on the rise, and families are staying longer in shelters. The impossible choice between shelter, adequate food, childcare, heating, and healthcare is a significant stressor for thousands of cost-burdened Vermont families. There are no good places to cut corners when there is not enough money for basic necessities. At John Graham, most able residents work full-time and are still unable to afford decent housing. In order to bridge the gap between low wages and high cost of living, we work to connect clients with the programs and subsidies they need for their families to thrive. The Fair Market Rent for the average two-bedroom apartment in Addison County is $946. If we assume that rent is 30% of income, a family would need to earn $3,153 monthly or $37,840 each year to keep up with the bills. Most of the parents we serve work at stores, gas stations, restaurants, farms or at entry level manufacturing jobs. They just can’t afford rising rent. To add to the problem, there are not enough affordable rental units available. The lower the income threshold, the greater the shortage of affordable and available units. Addison County has fewer than 30 units available for every 100 households with very low incomes! In addition, many contributing factors of stress on individuals foments widespread drug abuse. Opiate addictions in VT increased by 770% between 2000 and 2014. Deaths from overdose have multiplied in recent years. And the number of alleged child abuse or neglect cases filed in courts across Vermont has also climbed. Some experts attribute this rise to the impact of opiate addiction and increased homelessness on child safety. While fuel poverty is much more common and extreme among low-income households, a substantial number of Vermonters at all income levels are classified as Fuel Poor. Expensive fuel, energy-inefficient homes and appliances, and houses that are too big for current occupants (as is the case with many elderly people experiencing fuel poverty) can all contribute to unaffordable fuel costs. 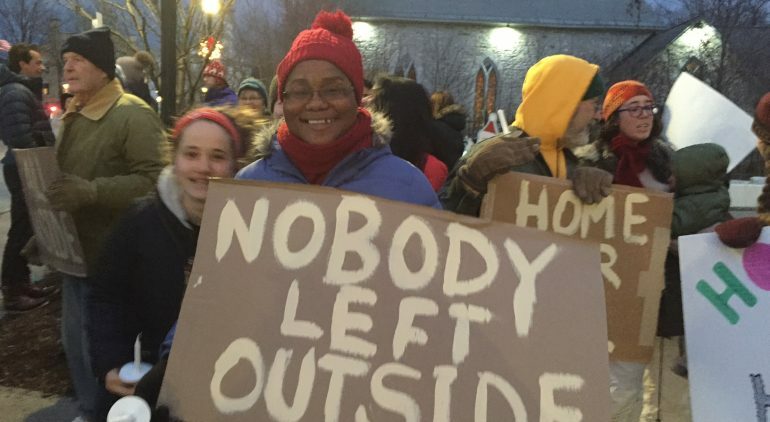 On January 27, 2015, a coalition of statewide groups counted 1,523 homeless Vermonters. Nearly one in five households counted included children.31 A one-night count in December 2014 showed that more than a quarter of those staying in state-funded shelters were children.32 More than half of those counted were families with children or unaccompanied youth. 16. Mauricio K (2013), Mapping New England: Rent Cost Burden over 30 percent by county, in “Communities & Banking,” vol 24, no 1, winter 2013. Federal Reserve Bank of Boston. 17. U.S. Census Bureau, 2009-2013 5-Year American Community Survey, Table B25070: Gross Rent as a Percentage of Household Income in the Past 12 Months, accessed via American FactfFinder. 18. Callis R and Kresin M. (2015), Residential Vacancies And Homeownership In The Fourth Quarter 2014, U.S. Department of Commerce, Social, Economic, and Housing Statistics Division. 19. Bowen, Patrick M (2015), Vermont Statewide Housing Needs Assessment. Prepared for Vermont Department of Housing & Community Development by Bowen National Research, pg 73. 20. Bowen, Patrick M (2015), Vermont Statewide Housing Needs Assessment. Prepared for Vermont Department of Housing & Community Development by Bowen National Research, pg 74. 21. Teller-Elsberg, Sovacool, Smith, and Laine (2014), ENERGY COSTS AND BURDENS IN VERMONT: BURDENSOME FOR WHOM?, prepared by the Institute for Energy and the Environment at Vermont Law School for the Vermont Low Income Trust for Electricity, pg 5. 22. Fisher Sheehan Colton (2012), Home Energy Affordability Gap Ranking: Dollar Gap per Household by State. 25. MarmotReviewTeam(2011), TheHealthImpactsof Cold Homes and Fuel Poverty. Friends of the Earth. 26. Teller-Elsberg, Sovacool, Smith, and Laine (2014), ENERGY COSTS AND BURDENS IN VERMONT: BURDENSOME FOR WHOM?, prepared by the Institute for Energy and the Environment at Vermont Law School for the Vermont Low Income Trust for Electricity. Good for you, MNFC! But…for only one week in February? I would suggest that Middlebury Co-op continue to offer the rounding up of purchases to every shopper every day to support the homeless cause and other social justice causes. This is what is done at City Market Co-op and I hear it is a very successful effort. Thanks for your comment. Actually, you CAN round up any day of the year. Your donation will be divided equally between our two local food shelves. We have so many wonderful non-profits in the community that we’d love to help, but we only have the budget to match what we raise through a “Rally” once each quarter. When this happens, we want to make sure the organization gets the best possible outcome for their week, so we shout about it a lot more than the rest of the year. Last year, we passed on more than $10,000 to the food shelves through our round ups. Thanks for supporting this effort! Thanks for naming John Graham Housing and Services as a recipient of the Rally for Change! And thanks for being such great hosts of our display. You were very helpful, kind and friendly during my time. Thank you, Ted! We really enjoyed having you here yesterday to tell us more about John Graham Housing and Services! What a wonderful and crucial resource for our community!